Over at ADA Thailand, they've posted some pictures of the results of their themed aquascaping competition called Beautiful Glosso. 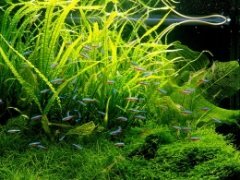 All of the aquascapes contain Glossostigma elatinoides, which is an old favorite of Takashi Amano for a carpet-like ground cover. The tanks are also all smaller sized tanks. 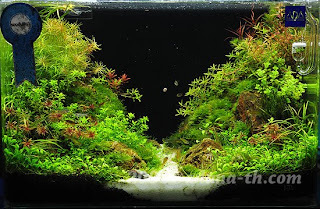 There are some very interesting nano aquascapes here, worth a look! You can also check out the winning aquascapes for 2007's nano aquascape competition. I've personally found that Hemianthus callitrichoides (HC) is a slightly better ground cover for smaller tanks, since the leaves are smaller and it requires slightly less maintenance. One thing to note about both ground cover plants is that eventually, they will begin to grow on top of themselves, killing the older growth and uprooting the remaining plants. This causes "bubbles" in the carpet to form. I haven't yet found a way around this other than to rip up the carpet and start over. Luckily, this usually doesn't happen for at least 8-12 months, depending on the growth rate. I like the idea of using Hemianthus callitrichoides as a ground cover for smaller tanks, because I'm not a fan of high maintenance ones since the leaves are smaller and it requires slightly less maintenance. Thanks for the tip, Ava.